Gold is considered by some to be a commodity, but we treat it as a non-liability-backed currency. In other words, gold isn’t created because someone makes a loan. Instead, it is created by mining. In addition, most commodities are consumed but much of the gold refined through the ages still exists. In other words, gold may be “lost” but it is rarely consumed. Even in jewelry, it can return to its bullion state with modest effort. Instead, gold provides one of the three functions of money. It is rarely used as a medium of exchange and we don’t price things in ounces of gold, so it isn’t a numeraire. But, it does act as a store of value. Thus, gold demand tends to rise during periods of monetary instability. Monetary instability is partially described as rapid increases in the money supply, currency depreciation and negative real interest rates. When any of these three events occur, they tend to be supportive for gold prices. In other words, gold prices tend to react to excessive money growth, dollar weakness and falling real short-term interest rates. Our gold model uses the central bank balance sheets of the Federal Reserve and the European Central Bank, the two most frequently used currencies for foreign reserves. We also add the EUR/USD exchange rate as a proxy for the dollar and the real two-year T-note yield. The model’s current fair value is $1,414, suggesting the current price is undervalued. We have seen the fair value decline recently. This is due to the explanatory variables adjusting in a bearish fashion; the Fed’s balance sheet is contracting, short-term real interest rates have increased and the dollar has strengthened. However, even taking these issues into account, gold prices still appear cheap. 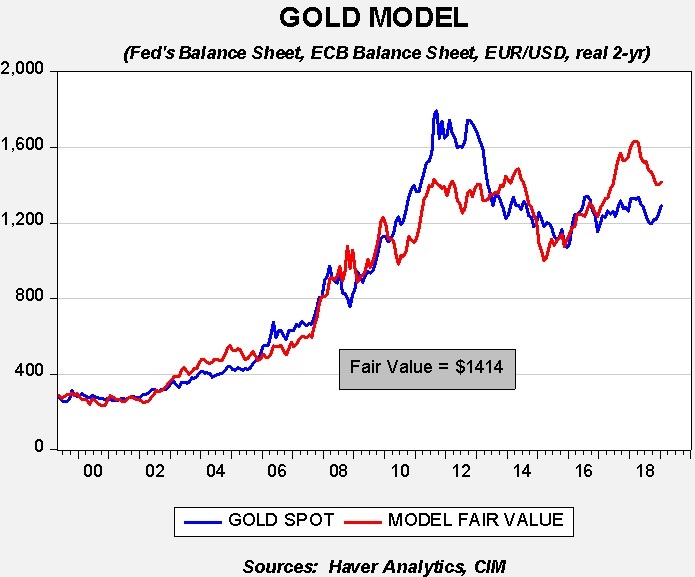 If our expectations of dollar weakness this year come to pass, the fair value for gold will likely rise. 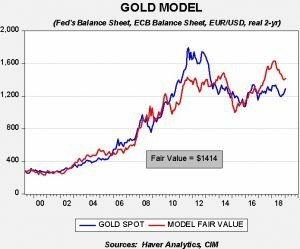 However, given the level of undervaluation, gold should have further upside potential in the coming months.